It’s not super well optimized, but you can see the 3.5 lines of text that Google is choosing to show beneath the link. That is the meta description. Why might Google be doing this? Google makes a lot of updates to search every year (1,000+ is what I’ve heard) across its algorithms/rankings as well as how the search results actually look and function. They’re always testing new things, though many times these do not actually turn out to accomplish what they were hoping (whether that’s better for users or Google is always the question). It’s extremely rare, though, that Google ends up rolling out something like that that affects so many queries. So this leads me to ask – why might they be doing this? Google has long said that their goal is to provide answers as quickly as possible to searchers. For a long time this meant sending them to the right websites, but there are so many issues with how Google ranks sites that this is an ever-present and ever-growing problem. There are simply too many SEOs who know how to game the system well! But why do that when you can use the content that sites have already written and show it to searchers before they even click into the page? That’s what Google is doing here. They’re crowdsourcing the answers. Even Danny Sullivan, who is in webmaster relations at Google and formerly ran Search Engine Land and its other sites, said that Google is pulling the meta description they want, not the one you’re writing. They even said to not update your meta descriptions! I’m putting on my SEO tin foil hat here, but they’re showing what they think the user wants, and that’s quick answers. Building out all of the technology required to power Answer Boxes and Knowledge Graphs has been expensive and time consuming for Google, no doubt. I bet it also has not returned the metrics that Google has required for it to show, so they are trying to figure out better ways to accomplish the same goal with fewer resources (time, money, people) put towards it. Google has since forever said that they might overwrite your title tags and meta descriptions if they think they are not relevant. So they’ve had the ability for a long time to process what your page is saying and show that to meet the query, it only makes sense that they’d start doing that more. I am sure there was a lot of pushback across Google in changing the meta description official length, but they ran it as a test and in my opinion it has paid off because they have now officially rolled it out. So in my opinion, they are leveraging technology they already had but invested in taking it to the next level. I also expect to see less development around Answer Boxes moving forward, as sad as that makes me because it has been a great way to get more organic traffic even as clickthrough rates for organic have dropped. Ok John, but what does this have to do with my business? What effect might we see? That’s a great question, and while it is still too early to know exactly how this will all shake out I have seen many many many algorithm and search feature changes since I started in SEO in 2009. So here are my thoughts for what this means for your business. When any change like this happens, you need to gather a snapshot of what you want Google to show for your main keywords (eg your prescribed meta description) and then what they are actually showing. As you may know, Google will often highlight the search query in your meta description to help with clickthroughs. If I were a betting man (and I am sometimes), I’d bet that they will stop doing this. But so far, they seem to have kept it so it’s worthwhile to do. 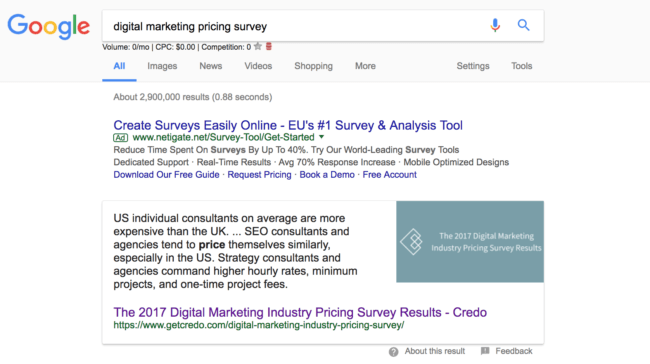 Based off of the above research, you should make a business decision about whether rewriting your meta descriptions (if you have a big site, this will be at scale of course) and running those tests to try to get Google showing what you want is worthwhile. If you see a big CTR drop but no rankings losses, then definitely do it. If you don’t, then keep improving rankings and traffic. Google makes hundreds of changes to their search results every year. Very few will affect your site in a material way. Unless you see a big drop in traffic and clickthrough rate, the best advice has always been to carry on doing what you know works and over time take advantage of new opportunities that things like expanded meta descriptions can bring to you.